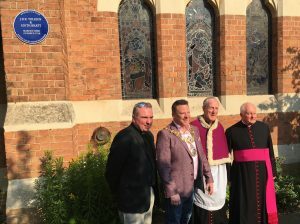 On July 6th The Mayor of Warwick unveiled a blue plaque at St. Mary Immaculate Catholic Church in West Street commemorating the marriage there of the world famous author and academic J.R.R.Tolkien during the First World War. The author of The Hobbit, The Lord of the Rings and other works based on his close knowledge of Anglo-Saxon and Norse folklore, married Edith Bratt of Albert Street, Warwick, on 22nd March 1916. 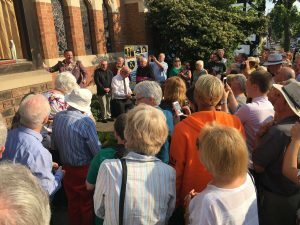 A crowd of local people, officials and Tolkien fans watched the unveiling. The Mayor said the council was pleased to recognise this as site of historical interest. Ronald Tolkien was an orphan; his guardian was a Catholic Priest who disapproved of the liaison because Edith was a Protestant. He demanded that Tolkien make no contact with Edith for three years – until he was 21 and could decide for himself. Tolkien obeyed this instruction, but on his 21st birthday he wrote to Edith and she agreed to marry him. 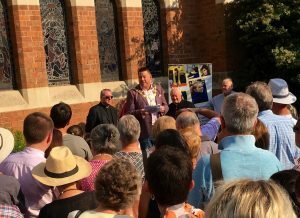 The plaque was awarded by The Town Council at the suggestion of a local resident and member of the congregation. 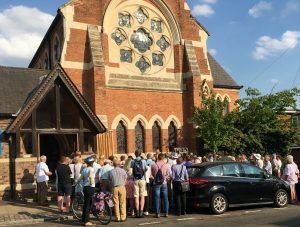 It also notes that the building was designed by the celebrated architect E.W.Pugin.